Through partnerships with globally recognized and accredited organizations, Sierra Agra aims to strengthen its means of implementation and revitalize its international network in solidarity for export oriented sustainable agriculture. CAPPA, Commercial Agriculture Producers and Processors Association. CAPPA member companies are situated in the rural heart lands of Sierra Leone creating employment and improving the essential basic needs through their investments and Corporate Social Responsibility projects. To date more than 12,000 jobs have been created of which more than 30% are women. Lack of available technical skills in the country is a hindrance to development and many companies have started training and preparing Sierra Leoneans to fill skilled positions. CAPPA places itself to act on behalf of its member companies to dialogue with stakeholders to break barriers and improve the enabling environment for agribusiness in the country. Sierra Leone faces many challenges in the agricultural sector of which CAPPA representatives can assist with. Ensuring the long term future and prosperity of the sector requires investing in people to provide the skill sets needed to manage agricultural and agri-processing operations. All CAPPA members now have Sierra Leoneans in their management teams and this will increase as more experience and skills are developed and that integrity is seen and understood to be an essential element of private sector requirements. Sierra Agra is facilitating a program for CAPPA members to teach, train and mentor farmers employed by Sierra Agra in its Anchor Community Farming Model. The Ministry of Agriculture, Sierra Agra, and CAPPA are actively working with Netafim on providing competitive pricing, volunteering time and joining together to maximize social impact. An action-oriented commitment to 100% sustainable juices, purees and concentrates by 2030. The Sustainable Juice Covenant (SJC) is a global initiative to make the sourcing, production and trade of fruit- and vegetable-derived juices, purees and their concentrates 100% sustainable by 2030. Coordinated by IDH, the Sustainable Trade Initiative, and committed to by leading beverage companies, the covenant is a moral, not a legal, obligation. Enabling private sector companies to make proactive, non-competitive improvements across the juice industry supply chain – from raw materials to consumer-based products such as drinks, nectars, juices and smoothies. With the support of AIJN, the European Fruit Juice Association, the companies work together to increase social and environmental sustainability at farm and processing level by rolling out sustainability certifications throughout the supply chain. Globally, fruit juice and nectar consumption is at 38,5 billion liters – and 9,6 billion liters in the EU, the biggest consumption region. As the market grows, we recognize that sustainability is the way forward for the juice industry – and that we can and should play an important role in making our supply chains as healthful as our drinking habits. Tradin Organic is the global front runner in organic ingredients, offering a full service portfolio based on unique sourcing, sustainability initiatives and processing & distribution capabilities. Sierra Agra has already undertaken an off taker partnership with Tradin Organic (tradinorganic.com). Sierra Agra is working work with Tradin to establish improved quality controls, internal control systems, plant audits, certification control, as well as sending regular samples to off takers and accredited labs for quality control standardization. Tradin is coordinating: Fair Trade, Hazard Analysis and Critical Control Point (HACCP), Kosher and Organic and we expect to have these as soon as possible. Tradin has contracted with global leader Control Union to oversee and coordinate Sierra Agra’s certification process. With deep knowledge and extensive experience FairMatch Support develops, improves and expands sustainable value chains of various products, such as nuts, cocoa, fruits, vegetables and fisheries in developing countries world wide. Their key activities are: Assessing and analyzing the supply chain and market opportunity, creating strategic partnerships and alliances, planning, managing and promoting vertical cooperation in supply chains, using market demand as the accelerator, increasing sustainability, quality and quantity of the products and production processes, promoting transparency and equitable distribution of margins among the different chain partners, providing support services through a network of local business support organizations, and servicing through a network of local business support organizations. 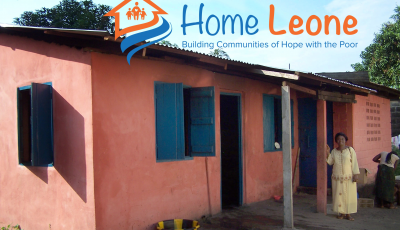 Home Leone is a unique, holistic slum solution. This landmark, entrepreneurial initiative, enables opportunities for relocation to new communities. Home Leone aim to relocate hundreds of thousands of people, if not millions, by leading through example. To present to the world a working model, by releasing the potential of the poorest who currently live in slums moving from devastating conditions to a new way of life. The pilot, in Sierra Leone is delivering 344 quality homes, circa £5,000 ($6,250) as part of vibrant, sustainable and healthy communities. Home Leone are already radically improving lives and opportunity in a nation facing so many challenges. In part, this is being delivered by corporate teams working alongside local people as part of their Corporate Social Responsibility (CSR) Programs. Participants and partners are on a journey of self-discovery and team building that helps the worlds poorest whilst effecting powerful personal and corporate transformation. Woord en Daad connects people, communities, schools & educational centers, entrepreneurs, and local NGO’s worldwide. We are motivated by the Christian perspective of justice and compassion to realize a dignified existence for every individual. IDH convenes companies, CSOs, governments and others in public-private partnership to drive the joint design, co-funding and prototyping of new economically viable approaches to realize green & inclusive growth at scale in commodity sectors and sourcing areas. Mango and coconut farmers in Sierra Leone will receive training and support to improve their performance, and ultimately their profitability and livelihood in Sierra Agra’s project, Juice Worth the Squeeze to engage 7,000 farmers by end-2020. IDH will support the project through conducting a Service Delivery Model (SDM) analysis – a detailed quantitative analysis of Sierra Agra’s service delivery and sourcing structures, to optimize the structure of the smallholder engagement and ensure that there is a clear business case for both the smallholder farmers and Sierra Agra. MCE Social Capital is a nonprofit impact investing firm that uses a pioneering loan guarantee model to generate economic opportunities for hundreds of thousands of people, particularly women, in more than 30 countries. Funding by MCE Social Capital will advance Sierra Agra’s DOYPACKⓇ Juice Pouch Line by financing equipment for the installation, proposed for Q2 2019, in collaboration with Tropical Food Machinery. The juice processing line is capable of producing approximately 400,000 250mL pouches per month. This investment will stabalize factory utilization and employment throughout the year, among other benefits. Copyright © 2017 Sierra Agra Inc.